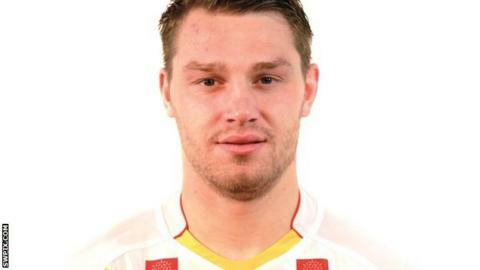 Catalan Dragons recorded a third Super League win in a row to continue their resurgence against Hull KR. Rovers played their part in the match, scoring four tries through Greg Eden, Jordan Cox and a brace by Omari Caro but were unable to contain the Dragons. Catalans scored six tries with Elliott Whitehead and Michael Oldfield both crossing twice, while Morgan Escare and Daryl Millard also touched down. Thomas Bosc added six goals and a drop goal for Catalans. Such a fine run of form for the Dragons came off the back of a miserable start to the season, which saw them lose their opening five games and put pressure on coach Laurent Frayssinous. However four wins in a row in all competitions has lifted the spirits at the Stade Gilbert Brutus, with Whitehead and Leon Pryce among the stand-out performers. Meanwhile Rovers showed signs of fatigue after their bruising derby victory and the turnaround of a trip to Perpignan. Catalans made a flying start, Escare popping up on the shoulder to collect Zeb Taia's offload and scoot in for an easy try and went further ahead soon after when Whitehead touched down his own chip ahead after another Pryce offload caused problems for the Rovers backline. With powerhouse prop Poore withdrawn through injury, it looked as though it could be a long evening for the visitors when Oldfield tracked Bosc's chip to the corner to score but their response was impressive. First Greg Eden collected Travis Burns's offload to score, and Jordan Cox's opportunist effort from close in reduced the gap. The half ended with Rovers in front when Caro sprinted in to finish off a fluid move and Burns landed his third successful kick of the half. Rovers coughed up a set-of-six at the beginning of the first half when Kevin Larroyer was penalised for holding, and the result was a try within 90 seconds of the restart as Millard finished well in the corner after Escare slipped the ball wide. Caro waltzed in out wide soon after as Rovers responded with a flowing move of their own, and the end-to-end nature of the match was reflected in another sliding try to the corner with Oldfield picking up his second score. Pryce went down injured but was able to continue despite a shin problem, his high bomb leading to Whitehead's second score - the former Bulls back-rower snaffling the dropping ball despite the attentions of Caro. Bosc clipped a brace of kicks over to punish Rovers indiscipline close to their own try-line and then landed a drop goal to give the French club the two points. "They were too good for us today, they seemed to do everything little bit quicker than us and we let ourselves down with a few silly penalties in the second half that didn't help. "I'm scratching my head at how we scored 24 points, we didn't have any ball in decent field position but credit Catalans they deserved to win today. "No complaints. We hung in there. I can't be too critical as we tried hard but conceding a tackle four penalty we lost a lot of momentum." Replacements: Mounis, Maria, Paea, Garcia. Hull KR: Eden, Gardner, Welham, Salter, Caro, Burns, Hall, Poore, J. Hodgson, Weyman, Larroyer, Horne, Costigan. Replacements: Netherton, Cox, Carlile, Lovegrove.